First Peter 5:7 is one of the sweetest verses in the Bible. Peter recorded this truth for people who were under severe persecution. He writes, “Casting all you anxieties on him, because he cares for you.” We all have the desire to control things that we cannot, and we often forget how deeply God cares for us. If I had authored the verse, I might have chosen a different quality of God to emphasize. Something like his perfect wisdom or his unlimited power. Logically, it would make more sense to think that even though I am not in control, an all-wise, all-powerful God is. But the Holy Spirit saw fit to inspire Peter otherwise, and I’m glad he did. When it comes to anxiety, he chose to emphasize the compassionate, softer side of God. When I am fearful, I find comfort in this truth: I’m not alone in my struggle, and God cares. The challenge, of course, is that anxiety can wake you up at 3:00 AM. The silence in your house echoes the message: No one’s here and no one cares. In these times we feel so very alone. We stare into the darkness trying to find a reasonable solution to the trouble we’re in. The alarm clock interrupts our thoughts, but not our sleep, a shrill reminder that this is the time we should be waking up had our anxious thoughts not awakened us earlier. As we enter into the day, all those around us seem to interact quite naturally with one another. They laugh about their weekend. They complain because it’s Monday. They tell stories about their relationships or listen to others who do. We smile and exchange formalities as if we’re part of the group, but our anxious thoughts are all our own. They whisper deceitfully: No one knows, and no one cares. But the Bible tells us this is not entirely true. It may be true that the smiling people around you are clueless to your difficulty. It might even be true that some of them, if they knew, wouldn’t care. But God knows, and he cares. This is why the first principle of overcoming anxiety is belief. You and I must learn to believe God’s Word, not our feelings. We live in a world where feelings reign supreme. Listen attentively to the conversations around you, and I’m sure you’ll agree. Every day, people are making life-changing decisions from a feelings-foundation. Statements like, I feel like this is the best decision for me, or I just don’t feel like I love him anymore are commonplace. This mindset has even drifted into our spiritual conversations. I often hear people say I feel like this is God’s will for me or I just had a feeling that it was the right thing to do. Because our feelings are personal, deeply felt, and sincere, they are easy to believe. But that doesn’t mean that we should believe them. The root word for “believe” occurs 241 times in the New Testament. Nearly half of those times it is used by the apostle John. He directed us to believe the Father, his promises, his Word, and his Son. But not once did he say we should believe what we feel. This is the necessary starting point for victory over feelings of anxiety. It’s time to ask yourself: what do I really believe? 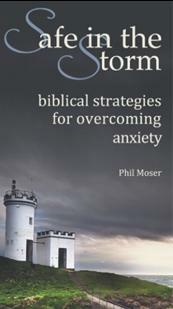 Excerpted from Safe in the Storm: biblical strategies for overcoming anxiety, p. 9-10. Available at Christian bookstores and online retailers. This entry was posted in Biblical Strategies, worry and tagged anxiety, overcoming anxiety, panic attacks, worry. I’m reading this book right now! It’s terrific – so Biblically-based. Thank you! Dear Phil, Today Esther and Abigail are leaving Japan to go to college, and America seems so far away. Sally and I are going to have to adjust to an empty nest. This article challenged me to put my whole focus and trust on His Word and faithfulness rather than my feelings. Our Lord Jesus does care and He does hear. Thanks so much for sending these thoughts on First Peter 5:7.